(Da qing; Qiug dai) Chinese woad is a flowering plant with dandelion looking leaves and clusters of small yellow flowers. Although it has been used to produce blue dye, It is most well known in the medical industry for its ability to inhibit viral replication and attachment to healthy cells. This makes it a potent viral and antibacterial remedy. In fact, it is used within a combination formula for the treatment of HIV and AIDS. This is a valuable herb, especially as we are faced with the challenge of antibiotic resistance. Leaves and roots have been used in Traditional Chinese Medicine for thousands of years to treat flu, encephalitis, measles, hepatitis and mumps and cancer. 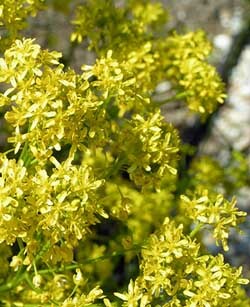 Chinese woad is easy to grow and loves lots of fertilizing (preferably manure). Ht 3ft.